LEESVILLE — The Crawford Park District will have one of it’s most popular events this weekend, at Lowe-Volk Park, when it celebrates Living History Days. The two-day extravaganza is Saturday from 9 a.m. to 4 p.m. and 8-10 a.m. and Sunday, 10 a.m. to 4 p.m.
Lowe-Volk Park is on Ohio 598, just a couple miles north of Galion. 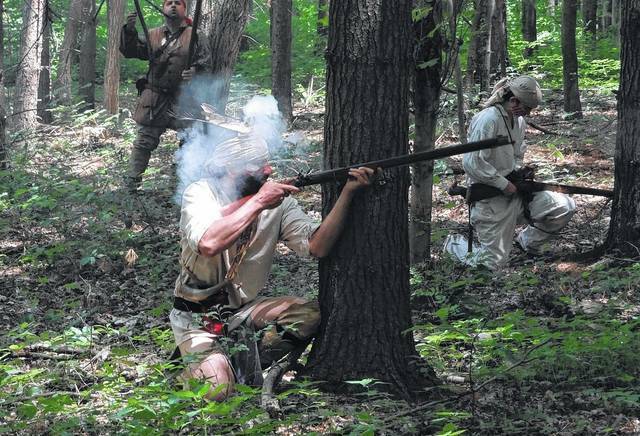 There will be many Revolutionary War period demonstrators and new vendors along, with military and Native American camps. Other highlights of the weekend include a presentation by Shequonur, a Shawnee Storyteller; and a children’s nature walk. There will be two opportunities to participate in a bus tour to the Colonel Crawford Burn Site Memorial in Wyandot County. Beginning at 8 p.m. on Saturday evening, there will be woodland lantern tours that will focus on Native American life. Living History Days will open at 9 a.m. Saturday with a Scout-led flag raising and a singing of the National Anthem. For more information, contact the Crawford Park District office at 419-683-9000, visit their website or find them on Facebook. Following the re-enactmenta historical bus tour to Colonel Crawford burn site. This will be the same schedule as Saturday, beginning at 10 a.m., except for Lantern Tour.